As a means of recording the passage of time, the 13th century was that century which lasted from 1201 to 1300. In the history of European culture, this period is considered part of the High Middle Ages, and after its conquests in Asia the Mongol Empire stretched from Korea to Eastern Europe. Map of Eurasia circa 1200 C.E. The Mongols, under the leadership of Genghis Khan, overran most of Asia, thus creating the largest empire to ever exist. They achieved this success in large part due to their amazing horse archers. 1199 — Pope Innocent III writes to Kaloyan, inviting him to unite the Bulgarian Church with the Roman Catholic Church. 1204 — Fourth Crusade sacks Byzantine Constantinople and creates the Latin Empire. 1205 — Battle of Adrianople: Tsar Kaloyan with his army crushed the (otherwise unbeaten) Fourth Crusade's knights and the soldiers of Emperor Baldwin I of Constantinople who was attacking Bulgarian lands with the goal to conquer them. 1206 — Mongols united under Temüjin, who is proclaimed "one Khan". 1212 — The Battle of Las Navas de Tolosa in Iberia sees the beginning of a rapid Christian reconquest of the southern half of the Iberian peninsula, with the defeat of Moorish forces. 1215 — King John of England forced to sign Magna Carta at Runnymede. 1222 — Andrew II of Hungary signs the Golden Bull which afferms the privileges of Hungarian nobility. 1227 — Genghis Khan dies during the prolonged siege of the Western Xia Dynasty capital (located in northwestern China), while the Tangut Western Xia Dynasty falls soon after. 1234 — the Jin Dynasty of northeastern China is conquered by the forces of the Mongol ruler Ögedei Khan. 1238 — The Thai Kingdom of Sukhothai is established, with Theravada Buddhism as the state religion. Later in the century it vassalises significant parts of modern Thailand, Laos, Burma, and Malaysia. 1249 — End of the Portuguese Reconquista against the Moors, when King Afonso III of Portugal reconquers the Algarve. 1250-1275 — the Arab or Persian born Muslim Kuwabara (Chinese: Pu Shou-geng) was appointed by the Song Dynasty Chinese government as the Commissioner of Merchant Shipping for Quanzhou. He published a detailed monograph of the shipping industry and maritime economy of China's seaports during his tenure there. 1258 — Baghdad (Iraq), seat of the Muslim Abbasid dynasty, is besieged and burnt to the ground by the forces of the Mongol commander Hulagu Khan. The last Abbasid ruler Al-Musta'sim is executed by means of trampling horses. 1259 — the Mongol ruler Möngke Khan is killed in battle by a Chinese cannon blast at Fishing Town, Chongqing, located in southwestern China. 1260 — the Mongols are defeated by the Egyptian Mamluks in the Battle of Ain Jalut. 1270 — Restoration of Solomonic dynasty in Ethiopia, deposing the Zagwe dynasty. 1279, the Battle of Yamen marks the fall of the Chinese Song Dynasty and the rise of the Mongol Yuan Dynasty led by Khublai Khan. 1282 — Aragon acquires Sicily, after the Sicilian Vespers. 1284 — Peterhouse founded by Hugo de Balsham, the Bishop of Ely. 1291 — The Swiss Confederation is formed by Uri, Schwyz, and Unterwalden. Marco Polo and his family reach China. Ögedei Khan establishes a Mongolian dynasty in China. 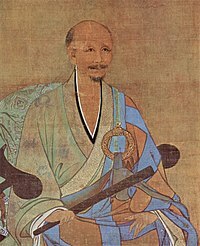 Some Mongol leaders convert from Tantric Buddhism to Islam. A period of civil unrest, Sturlungaöld, leads to Iceland becoming part of the Kingdom of Norway. Fall of the Ghana Empire. Fifth through eighth crusades of western European kingdoms against Islam. Finland gets its first city, Turku. 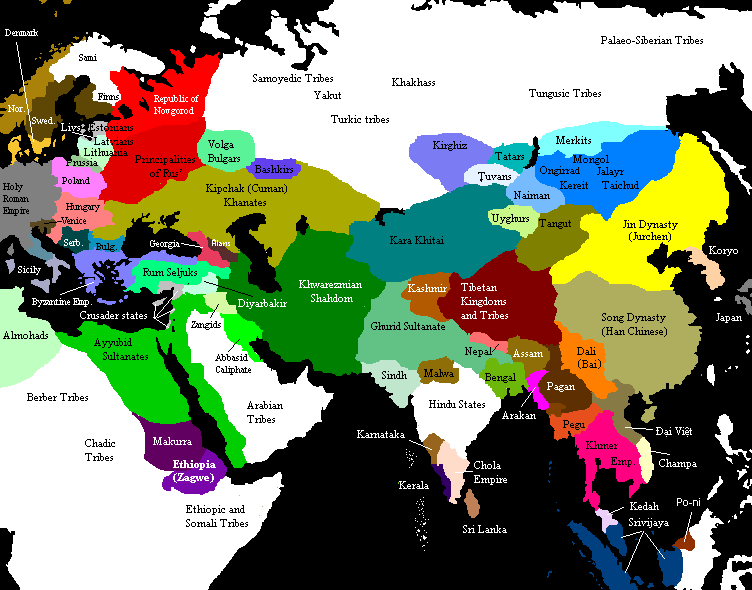 Most of Asia and Eastern Europe is conquered and incorporated into the Mongol Empire. The Medieval Warm Period ends. The Chinese become familiar with the story of the Lighthouse of Alexandria. This page uses content from the English language Wikipedia. The original content was at 13th century. The list of authors can be seen in the page history. As with this Familypedia wiki, the content of Wikipedia is available under the Creative Commons License.